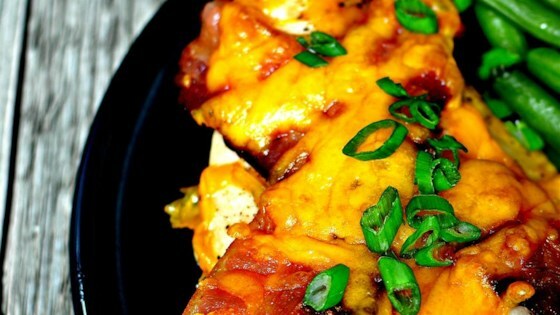 "Bacon and cheese add to this dish inspired by the famous one at Outback Steakhouse®, but with a twist! Now you can make it at home! Best served with garlic mashed potatoes and steamed veggies with applesauce for dessert." Place chicken breasts in a baking dish. Season with salt and pepper. Bake chicken in the preheated oven until it is just slightly pink in the center, about 25 minutes. Remove from the oven. Place bacon in a large skillet and cook over medium heat, turning occasionally, until most of the fat has rendered, about 5 minutes. Drain bacon slices on paper towels. Wrap around chicken breasts. Return chicken to the oven and continue baking until an instant-read thermometer inserted into the center reads 165 degrees F (74 degrees C) and bacon is crispy, about 15 minutes more. Sprinkle Cheddar cheese on top; bake until melted, 2 to 5 minutes. Serve with limes. I basted it with bbq sauce before & after baking. Easy enough to make but rather bland. Needs some adjustments. Easy to make. I used mozzerella and cheddar...delicious! Delicious! Tastes just like Outback’s Alice Springs Chicken! Great meal with broccoli and cheese with an over stuffed baked potato!! !